In most digital teams the vast majority of budgets are spent on people. People are our biggest assets. Almost all of our value is produced by them. Small changes in our ability to reduce the number of resignations and motivate them to work have an exponential impact on productivity. In the same way that user centred design has enabled organisations to create better digital services, relating to staff as people enables us to better understand what motivates them and create an environment where they can produce their best work. It takes time and effort, but the impact on productivity makes it more than worth it. However, when making plans for the future, the industry talks about resources rather than people. I feel just a little bit pedantic being that person who calls people out on their use of a word. But if it is true that the words we use shape the way that we think, it’s important that we use the right ones. We need to stop talking about people as resources. People are not resources. We are social animals who get along with some better than others, and usually storm before we can perform. We have hopes, dreams and ambitions that are constantly evolving. We are intelligent, opinionated and are more intrinsically motivated when we have autonomy. We work best when we find a sense of purpose in our work. We are motivated by managers who take time to understand who we are and think of us as more than cogs in a machine. When we plan with resources, it’s comparatively easy for an intelligent designer to predict how much of each resource we will need, and how they combine to produce a valuable outcome. Workers in a low skilled repetitive industry can be relatively interchangeable. For knowledge industries like digital, value is produced by tight knit teams of highly skilled people who communicate extensively while doing non routine work. You can’t just swap one developer for another and always expect the team to carry on performing as they were before. And you can’t assume that adding new people to a team will speed up delivery. Trying to make ‘resource plans’ without having a connection and intimate knowledge of the individuals and teams concerned increases the risk of bad decisions being made. So when we’re planning the work of digital teams, let’s reserve the word resources for desks, chairs and monitors and make plans with people instead. 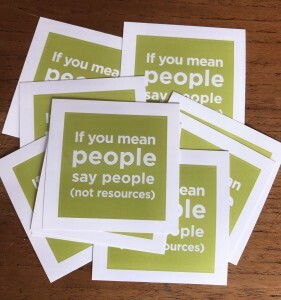 Also, check out Emily Webber’s awesome ‘Should you call people resources?‘ blog post. She’s made some stickers!